So I will start my entry with a correction. Sadly we did not see the Well of Mary yesterday. Well, we did but it wasn’t open. We went back this morning and were able to enter inside. It was a beautiful Greek Orthodox Church with a spring of water and more icons than you can shake a stick at. It had a small reservoir where you could fill bottle with the water from the spring. A truly beautiful sight to start the day. However, I am getting ahead of myself. This morning we had to pack everything up since we were going to another hotel this evening. After eating another wonderful breakfast of yogurt, eggs, and vegetables (odd right? 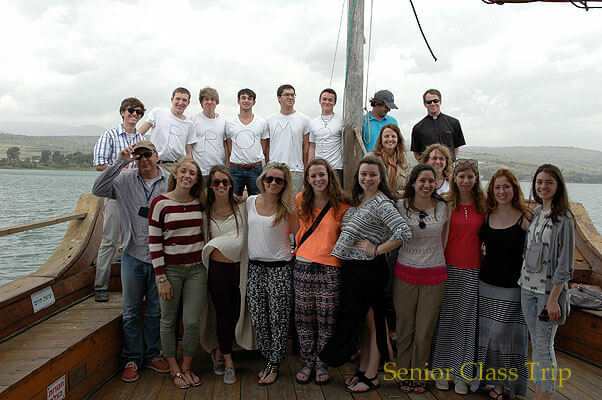 ), we loaded up and went to the mount of the Beatitudes. On the way there our guide saw the owner of the restaurant we would visit for lunch waiting for a bus. We stopped and picked him up to give him a ride to his destination. More on this later though. As we reached the mount of the Beatitudes we found a wonderful place in the sun to bask and listen to the Beatitudes read by Father Dan. We took a good twenty five minutes to look around the beautifully decorated church where St. John Paul II visited during his pontificate. There were so many beautiful sights; expect to see many pictures on your children’s Facebook soon. Next we visited the Benedictine monastery located where Christ multiplied the loaves and fishes. 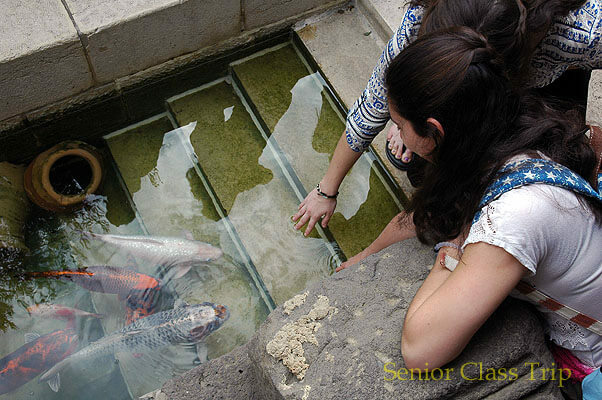 We were lucky to see the koi pond they had set up and several students came close to catching lunch for us. Alas! we were on a tight schedule so fishing out of pond was out of the question for today. We continued onward to the church built upon Peter’s house where Father said Mass and we were able to see some interesting architecture. We heard the gospel reading of the bread of life discourse and reflected on how Peter must have felt at that moment. Next we visited the ancient ruins of the synagogue. We heard Father read the passage where Peter and the other Apostles do not leave for, “Who else has the words of everlasting life?” After reflecting on this, we all took some snapshots and enjoyed the freedom to stretch our legs and get some good pictures of each other around such an old structure. Next our captain taught us a dance and we all had a good time celebrating the day, the wonderful weather, and good friendship. We pulled back into port and saw a boat that dates back to the first century. A boat that may have carried Jesus at one time. All this and we still didn’t even get to lunch. We headed on to the restaurant and saw the owner we had picked up earlier in the day. And then we had something so good that it deserves its own paragraph. We had three choices of dish for lunch: fish fillets, chicken, or a whole fish with head and bones and eyes. I stayed away from the whole fish thing, but the students were raving about eating the eyes of the St. Peter fish, so after some convincing I tried one. Not too bad all things considered. Imagine a cross between an olive and a Jolly Rancher. Really salty and kinda tough. I would not recommend. After lunch we went to Magdala, where Father Daniel and Jill met up with a few of their Legionary friends. We got a special tour from Father Tom and we were able to see what the Legionaries have been up to around there. They managed to find a synagogue in the rubble around the area and were restoring it. They had also built a new church to commemorate St. Mary Magdalen. After getting a little bit of free time we got back on the bus and took our leave toward Bethlehem. After a two hour bus ride we found out that we will be getting up tomorrow morning around 4:30 am to get an early enough start to say mass in tomb that housed Christ for three days. We have just finished our Bible reflection, so we’re calling it an early night tonight.